Proudly Serving Oracle Since 1966 . . .
Our Mission: To serve our community by providing timely, competent and professional care. CURRENT NEWS . . .
NEW FIREWISE TRAILER – (March 2019) Barbara Elliott of Pinal County Office of Emergency Management dropped off the new Pinal County Firewise trailer for use at special events to OFD. Watch for it at the Oracle Oaks Fest on April 13th. CERTS GO OUT – Thanks to those CERTs who were available to go to Mammoth to distribute water on Monday, April 1, 2019. This is a very important function of the CERTs, to help neighboring communities in need, and once again, they were there! Thank you very much to David, Kevin, and one of our newest CERTs Sandy Chavez. BRUSH BURN HAPPENED! – This last weekend (3/30/19) there was an official burn at the Brush Dump! There's plenty of room now for your brush and trims . . . and the weather's fine! Let's get as much done now before it gets too hot! • To communicate this list of people to the Oracle Fire District to ensure access to staging areas. To sign up for future meeting dates and more information, please email oracleequineevac@gmail.com. You can call OFD at 896-2980 or visit Facebook: Oracle Equine Evac. 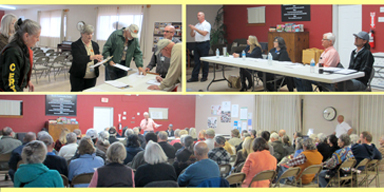 TOWN HALL 2019 – Oracle Firewise Board and OFD held a successful Town Hall at OCC on February 26, 2019. The subject was "Wildfire and Insurance: What You Need to Know." Agenda: Mary Harris and Margie Buchanan (co-chairs Firewise) organized the CERT and Firewise volunteers. Chief Jennings started the meeting after which Frank Pierson moderated the panel of insurance representatives: Aaron Franco (State Farm), Kelly Madril (Frontier Insurance) and Ruth West (Farmers Insurance). Click HERE to view the information flyer and agenda for the evening. NEW CERTS – (January 2019) Congratulations! Our latest group of CERTs have finished their classes to get officially sanctioned as CERTs (Community Emergency Response Team). They have rejoined our group with the added skills they have learned in these classes or ones they wanted to refresh on. photo: (l-r): Bernie Haas, Sandy Chavez, Jim McNulty, Margie Buchanan, Barb Haas, Leroy Fors and John Predgo. HOME ALONE UNITS – (January 2019) We are blessed with a dedicated group of volunteers who organize, install, and maintain Home Alone Units (HAUs). Oracle Fire District (OFD), would like to recognize and thank these volunteers who take time out of their busy lives to help those in need. If you are interested in obtaining a Home Alone Unit, volunteering, or donating, please contact Tina Acosta at Oracle Fire District at 520-896-2980. Presentation of donated Home Alone Units to the Oracle volunteer group included (l-r): Pete Bernstein, Bob Elder, Mary-Claire Bernstein and Jenine Mayer. Additional volunteers not shown here are Sherry Ziegler, Judy Kalish and Jill Caid. Thank you to this caring group of volunteers! ORACLE FIRE BOARD NEWS – (January 2019) Oracle Fire District (OFD) welcomes back board members Franky Hill and Bud Bristow who will serve another four-year term. Additionally, we are very pleased to welcome local, long-term Oracle resident Rob Walker, who was also sworn in as a newly-appointed OFD board member to replace Bill McMurry, who served on the board for five years and recently moved out of the fire district. Rob was also nominated to be the new Clerk of the Board. Administering the Oath of Office is newly appointed Chairman Will Ramsay. Thank you: Franky, Bud, Rob, Will, and Ellie Brown for your service to our community and to the Oracle Fire District! PARADISE, CA – (January 2019) Last year, they lost their community due to devastating wildfires. Are you interested in donating in some way to to either that community or for a firefighter who lost their home? Please check out these two links to the California Fire Foundation: CA Firefighters Benevolent Fund or to SAVE (Supplying Aid to Victims of Emergency) for general public victims. AED Presentation – On Tuesday, December 4, 2018, at the CERT meeting at Oracle Fire District, Fire Chief Robert Jennings and Margie Buchanan, Firewise Board Co-Chairman, presented an AED unit to Pastor Ed Nelson of Oracle Union Church. The AED unit included replacement pads and batteries that were purchased using fees charged by the fire district for use of the OFD brush dump. The AED (automated external defibrillator) unit is a user-friendly life-saving device that can allow the heart to beat again once it has stopped. First aid, basic life support and CPR classes are included with the unit. Co-chairman Margie Buchanan presenting the AED unit to Pastor Ed Nelson. 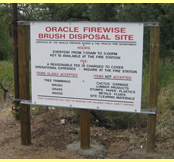 Fees collected by the fire district from the brush dump is used primarily to support the maintenance of the brush dump. Any extra money is used for community betterment projects such as the purchase of a CERT (Community Emergency Response Team) trailer and supplies used to support our firefighters and law enforcement during large incidents in Pinal County. MULTI AGENCY DRILL HOSTED BY OFD – Click HERE to see the latest video on Facebook from the Pinal County Sheriff's Office that took place on Sept 29, 2018 near San Manuel. FIREWISE PROPERTY WINNERS FOR 2018 – On Sept 11, 2018, the Oracle Firewise Board met to give out the annual Firewise Property Awards. The winner for personal property was Juan & Maria Rodriguez of DeMarco's. The winner for business property for their work along American Ave. was Pinal County Public Works. Chief Robert Jennings and Firewise co-chair Mary Harris are shown here with the Firewise certificate along with a sign that will be in front of each property. Thank for all for your efforts to make Oracle a much safer community! ORACLE FIREFIGHTERS – (August 2018) – The community of Oracle thanks our firefighters for helping out on the fires in California. AED presented to Living Word Chapel – Oracle CERTs and OFD Chief Robert Jennings presented an Automated External Defibrillator (AED) to Living Word Chapel on July 25, 2018. Mary Harris, co-chair of the Firewise Board presented the AED to Mike Sloan, an elder at the church. Firewise will provide training for church staff in its use. Firewise has provided AEDs for other non-profits in Oracle including the Oracle Public Library, Mountain Vista school and Rite of Passage. Chief Jennings said he wanted to personally thank Firewise and that this is a great example of support groups and the wonderful people involved doing great things for the community. SUMMER 2018 FIREWISE NEWSLETTER – By now you probably have received our latest 2018 summer newsletter in the mail. We try to get one out each year as part of our Firewise goals for being an officially-certified Firewise Community. This issue is now available on line. Click HERE and read about what's happening at OFD now! This two-page issue covers information on Firewise assesments and grants, defensible space, the Firewise and Cert groups, firewise community events, Oracle Emergency Notification System, Home Alone and the new horse owners group OHO. it also contains an Emergency Evacuation List for your reference. You can also access just the list HERE. What is a Red Flag Warning? – According to the National Weather Service, a Red Flag Warning is issued when a "combination of low humidity, strong winds, dry ground cover, and warm temperatures are expected to bring critical fire weather conditions to the warned area." When we have these conditions, you may see our NEW, larger red flag flying in front of the fire station. Please be vigilant and cautious especially on these days. You can't afford not to be on this list for emergency notifications. Click to go to the "ENS" form and be sure to get any additional numbers (besides your landline) in the system by filling it out and returning it to Oracle Fire District. Just drop it by the fire station. FIREWISE PUBLICATIONS – Here is a list of firewise publications that may be useful to you. Click HERE to select your interest. MORE INFORMATION – Would you like more useful info on wildfire? Click HERE for News & Information, Fire Weather, Maps, WIldland Fire Data in Google Earth, Arizona Fire Ecology, WIldland Fire, Firewise Resources, Smoke and Air Quality, Info for Before, During and After a Wildfire, How to Help and Fire Prevention & Education topics. There are several excellent artlces relative under each topic you can click to at the Arizona Interagency Wildfire Prevention website. at Water Tank Rd: 0.08"
at Water Tank Rd: 7.28"
at Water Tank Rd: 20.34"
at Apache Joe Ct: 21.07"
• 2019-2020 DRAFT Operations Budget is now available for viewing. Click HERE to view it. There is also an added addemnum, view it HERE. • 2018-2019 OFD Approved Operations Budget is now available for viewing. Click HERE to view it. • The 2017-2018 OFD Adopted Operations Budget is also available for viewing. Click HERE to view it. is shown on the sign just before you get to the Oracle Post Office. You can't afford not to be on this list for emergency notifications. Click to go to the "ENS" form and be sure to get any additional numbers (besides your landline) in the system by filling it out and returning it to Oracle Fire District. TO SEE MORE FIREWISE INFORMATION CLICK ON OUR FIREWISE PUBLICATIONS PAGE. BRUSH SITE – The brush disposal site is open on Sundays as well as the rest of the week (7am-5pm). ORACLE STREET MAP – We have an online printable version of Oracle map book pages with hyperlinked street legend, one hundred block grid lines (in 400 increments) and gallons-per-minute, color-coded hydrants. Click HERE or on the map below. NEIGHBORHOOD FIRE RISK EVALUATION MAP – An on-site evaluation has been completed for all addressed properties located within OFD boundaries. To see the Oracle map with evaluations Click HERE or on the map below. TAXING INFORMATION – A list of OFD Taxing Information is available by clicking HERE as well as information as to what your Fire Dept. Taxes have provided since 2004. OFD ORACLE WEBCAM! – We have a webcam in Oracle atop the Fire Dept. 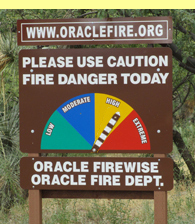 building thanks to a donation from the Oracle Firewise Board. It will refresh every minute. Click on the blue icon in the weather station box near the top of this page.